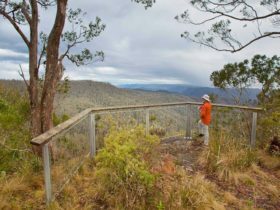 World Heritage-listed Cunnawarra National Park, 70km from both Armidale and Dorrigo, is a great place for 4WD touring, hiking, camping and birdwatching. Experience the beautiful diversity of rural NSW at Cunnawarra National Park, which links the snow gum high country of New England National Park with the scenic ranges of Oxley Wild Rivers National Park. The park is part of Gondwana Rainforests of Australia World Heritage Area, and features many incredible vistas that can be explored on foot, by bike, or in a 4WD. 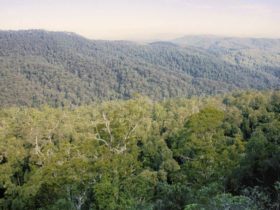 Among them are the spectacular gorges, cliff lines, and deep, steep-sided valleys of Great Escarpment; the towering eucalypt forest that lines Styx Forest Way; and the ancient Antarctic beech rainforest at the headwaters of Georges Creek. Be sure to check out the view from Beech lookout, where you can gaze down upon some of the tallest trees in all of NSW.